The Sheffield Children's Hospital is the headquarters of the Sheffield Children's NHS Foundation Trust. The hospital began an exciting major new-build programme in 2013, which is now complete. The new children’s hospital was designed to engage and amuse visiting children and their relatives. One of the key features to the re-design was to have an installation in the reception area that was welcoming and offered children somewhere to play or if unable to play, something that would be visually stimulating. The solution was a very large ‘play tube’. This very bright and colourful feature creates a real impact when visitors arrive at the hospital with the inner of the tube being a play area. Arkoni was delighted to have been awarded the contract to glaze the tube with fire resistant glass and be part of this wonderful piece of design. 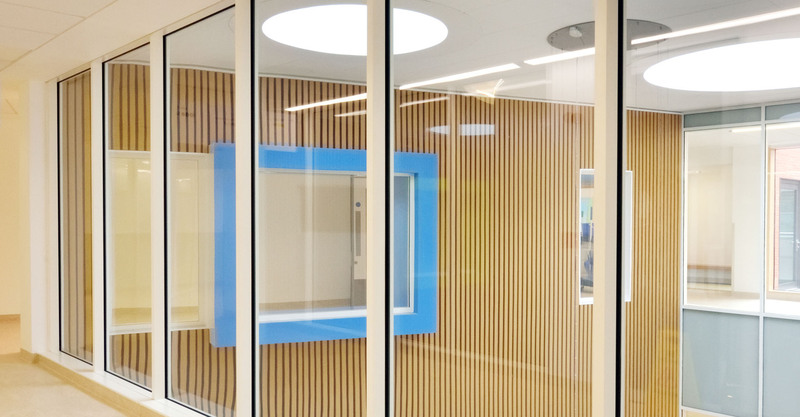 Keeping a light and open feel to the hospital was of paramount importance; therefore glass screens were specified along the corridors and public areas. These were supplied and installed by Arkoni using the latest fire resistant glass and steel frames. Naturally hospitals have a job to do, so to help nurses on ward stations look after their young patients, Arkoni installed small view windows with integral blinds set inside the double-glazing. These screens enable nurses to view patients without disturbing them. The bright and light feel of the hospital really helps children not to be apprehensive about their visit, aids well-being and combines form and function with a beautiful outcome.